Too many executives, politicians and bureaucrats today believe that simply “getting the job done” is a show of leadership. They forget that being a leader means inspiring, not just organizing. 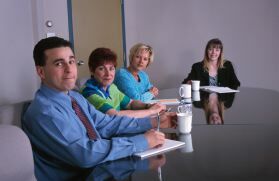 In fact, I’ve been in many organizations where the leader — the person who truly sets the ethical and philosophical tone for the working group — is not the person who is “in charge.” When a manager sets the goals, then allows someone else to determine the methods by which those goals are achieved, the results can be catastrophic. Who do the people on your team look to as the leader? As Brian McCormick, director of the on-line Leader Network reminds us, chivalrous, honorable and productive actions are crucial for anyone who wants to be the real leader, not just the person who maintains the to-do list. A leader is someone who people choose to follow, period. A leader influences others to do things that they may not otherwise do. Through the initiatives undertaken by the remarkable leaders recognized by this organization, those leaders improve the lives of affiliated individuals and organizations. Ideally, the effective leader is a person of integrity. It takes no title to be a leader, and it is crucial to understand the difference between managing and leading. Philosophically, a person must be a leader first, then a manager. A leader can be a manager, but a manager is not necessarily a leader, although frequently organizations confuse the two. The comparison below clarifies the difference between leaders and managers. Manager: You have your affairs managed — when you are managed you are told what to do. Leader: You follow a leader willingly, by choice. Manager: People either abide by or rebel against someone they simply view as a boss. Leader: People follow their leader. Manager: A position of authority bestowed upon someone. Leader: A position of respect earned by actions. What does a leader do? The leader sets the course and makes sure everyone in the canoe is paddling in the same direction.